Opportunities to train in China with the UK Kung Fu School. 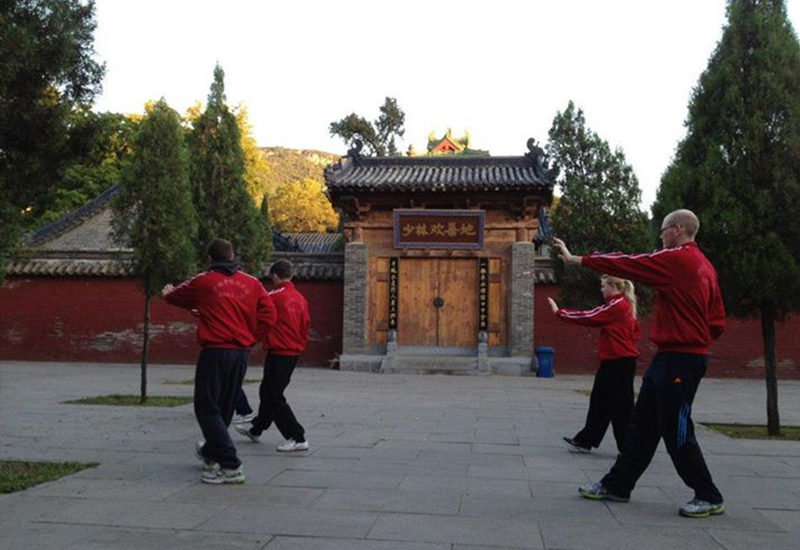 Over the last 10 years, the UK Kung Fu School has taken over 75 students to train at the famed Shaolin Temples in China. 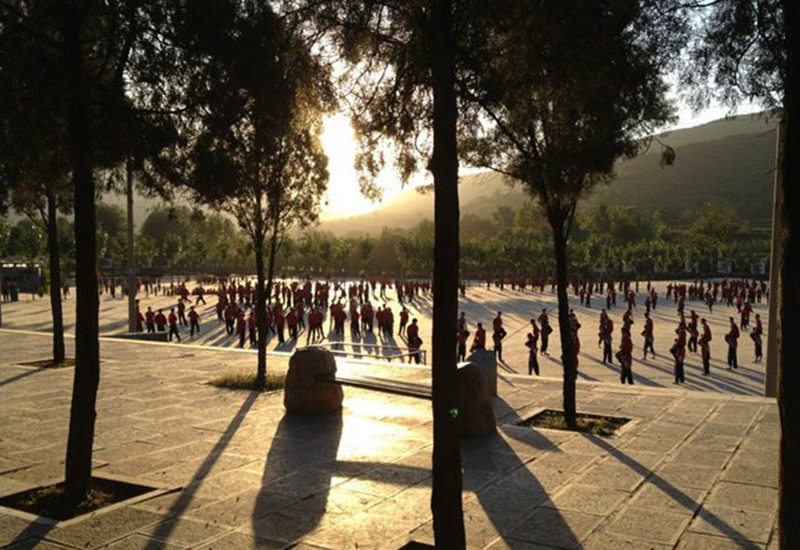 Our first trip in April 2004, the UK Kung Fu School took 11 students to train in china at the foot of the Song Shan Mountains, at the famous Shaolin Temple. For most, it was the first time out of Europe, with the group's age range between 17 and 34. All had varying abilities in martial arts, but what they all had was passion and enthusiasm. Neil McCarthy, Senior coach of the school organised the trip, having been to china on a number of occasions to train his Kung Fu. The group arrived in Beijing, much to the delight of everyone and stayed in a comfortable hotel before embarking on another internal flight to Zhengzhou and then a bus trip to Shaolin. It was pouring down with rain and a bank holiday weekend, so the traffic queues were huge. We ended walking half a mile in the rain, just to get to the school where we were to train. "From the moment we arrived in Shaolin, we felt like we had landed in 'kung fu land'! Everywhere we looked there were students from the age of about 8 to 21 practising kung fu. It was a big culture shock when we arrived at the school but we were soon settled in to the training programme and regime of the student's everyday life. It was such an amazing opportunity to experience the life and training in a Chinese kung fu school. There were days when we were so tired and ached so much that it was hard to get up or start the next session, however, this just added to the whole experience. The trip was an experience that I will never forget." Training began at 5:30 am for 1 Â½ hours, then 3 hours after breakfast and 3 hours after lunch. It was arduous, given that most of the students only train 1 - 5 hours a week. Everybody ached for 3 or 4 days, but it was a great feeling! We trained hard for 4 days and then had a well deserved day off where we had time to visit the temple grounds and explore the Song Shan Mountains. This is the famed mountain where Damo mediated for 9 years. Another 4 days of hard training after the break concluded our time at the school. We learnt so much from broad sword, spear, staff, tai chi, chi gung and open handed techniques. More than this, we had a valuable life experience that will stay with us for ever. We forged friendships with the coaches that we still keep in touch with and we learnt to focus our minds and bodies even when it felt like we did not have an ounce of energy left! Each of the students that attended brought something back with them that will last a lifetime. An experience like this cannot be conveyed in words. Training is difficult but to be absorbed in a culture where such practice is normal gives you an energy that you can't describe. Great trip and great experience all round." We returned to Beijing and had 3 days doing our tourist bit at the Great Wall and the Forbidden City. We all came back a little stronger and a little more confident in our selves and certainly much fitter. After almost a year in the planning and saving, this was truly and experience that I would want everyone to have. The UK Kung Fu School returned to China in 2005, 2007, 2010, 2012 and most recently in 2018 to train at Shaolin.